Acacia Mining said Tuesday that a senior manager has been arrested and charged by the Tanzania's anti-corruption agency. This brings to four the number of staff arrested and charged with corruption by the Prevention and Combating of Corruption Bureau (PCCB). Last week, an employee and a former employee were held by the PCCB and charged with 39 counts of criminal offences. A week prior, a South African employee of Acacia was accused of signing a cheque to a government official among other charges. He was released on bail. The company said Tuesday that its senior manager, who is a Tanzanian national, had been accused of "some (but not all) of the 39 criminal charges" that the other two were facing. "We understand that he has been charged with various counts of tax evasion, forgery and money laundering, but have not yet seen a copy of the charge sheet," Acacia said in a statement. PCCB is quoted by local media as saying that the arrests are part of an "ongoing investigation into natural resources exploitation" and "war that the government is waging in the minerals sector", Acacia said. The miner is locked in a 19-monthlong conflict with the government over taxes. The government imposed a ban on the export of raw minerals and slapped the company with a $190 billion tax claim. While negotiations between Acacia's parent firm, Barrick Gold, and the government have been ongoing, no conclusion has been reached yet. "Acacia is deeply concerned about the increasing risks to the safety and security of its people given the criminal charges being brought by the Government of Tanzania," the miner said Tuesday, adding that "the company believes that these recent actions represent a significant escalation of governmental pressure." 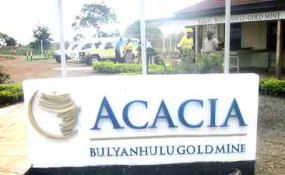 Acacia is Tanzania's largest gold miner.